SMU practice rooms aren’t just for meth labs anymore. Tonight was supposed to be filled with Glee, beer, and pretentious dinner. Instead, we’re under a tornado watch. 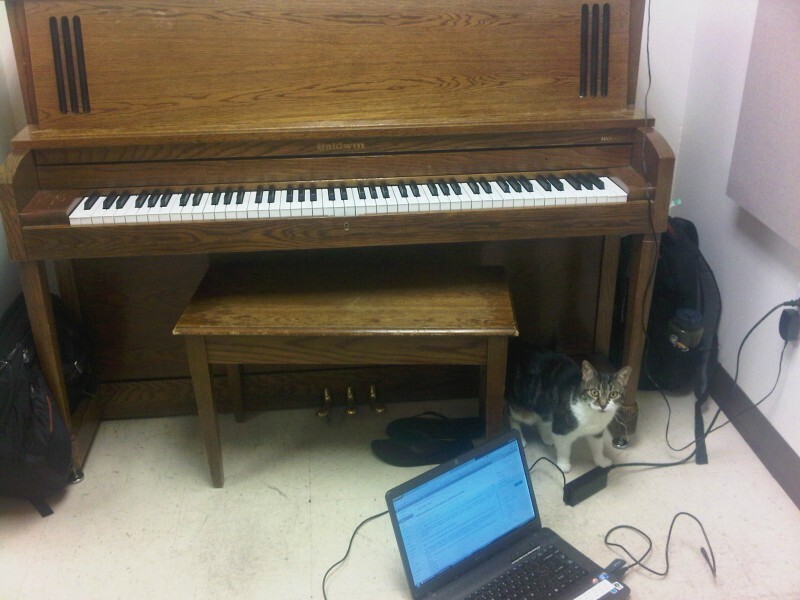 So JT and I, along with my cat Lucy and the new Gaga album, are spending it in a practice room at SMU. You might as well call Lucy "Toto"
Ice cold milk in a glass–milk should only ever be drunk from a glass. It tastes terrible in a plastic cup. Yellow cupcakes with chocolate buttercream icing from Central Market. Truly the best store-bought cupcakes in the DFW area. Call me hungry, but this seems to me to be one hell of a nonsensical post. But Casey wanted me to post something, so this is what you get folks. Don’t say we didn’t warn you. Sigh, at least there are vending machines down the hall. Casey thinks she would have just grabbed her phone and blogged through the WordPress app, put Lucy on a leash and split food items w/ JT to carry as we scrambled to the makeshift fallout shelter! Food takes precedence, EVERY TIME! Sounds like a delish meal to come back to though! I need to make a tornado box for next time. Contents: (a) harness, leash, water bowl, and litter box for lucy; (b) beer; (c) utz; (d) cupcakes and milk; (e) a cheese board/knife set; (f) cheese; and (g) steak. (3) The screencap of the radar with Lucy inset is badass, how do you do that? Best. Cupcakes. Ever. They aren’t metaphorical for nothing. That’s easy: I took a screenshot of the radar and pasted it in Paint. 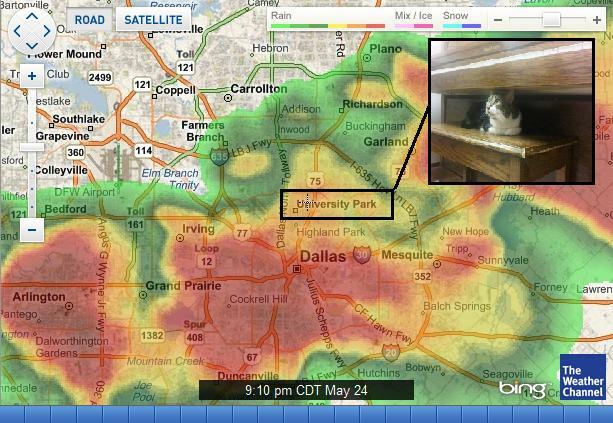 Then I opened the picture of Lucy in another Paint window, resized it, copied it, and pasted it into the radar image. Then drew some boxes around it. I’m awesome.